ITIL Foundation training is an opportunity to take a step back from fire-fighting to explore Best Practices in IT Service Management (ITSM) as outlined in the ITIL library. In this class, you’ll learn about key ITIL structures, ITIL processes, and ITIL terminology, while discussing the practical implications of Service Management concepts. The course lays the groundwork upon which all further knowledge in specific areas of ITIL will be built. Our online ITIL Foundation training course provides a convenient, web-based introduction to the fundamentals of IT Service Management as described in the IT Infrastructure Library (ITIL®). Accredited by PeopleCert® and PMI®, the course helps students prepare for the ITIL Foundations Certification Exam by relating classroom concepts to real life examples with an interactive, case study-based approach. The online ITIL Foundation course is self-paced and takes approximately 16 hours to complete, including interactive exercises and practice exam questions. There are no prerequisites to taking this course, though some level of IT understanding is recommended. Learn how to turn ITIL theory into practice and get prepared for the ITIL Practitioner Certification Exam (which you'll pass - guaranteed). Want to stretch those training dollars? ITIL® is a set of standard practices or core publications originally developed in the 1980s as the need for standard practices in IT developed. The UK Government’s Central Computer and Telecommunications Agency developed the set of IT best practices recommendations. Over the years, and as IT and organization needs have changed, the IT Infrastructure Library has been updated and modified accordingly. The most recent set of standards were released in July of 2011 and are controlled by the Cabinet Office. 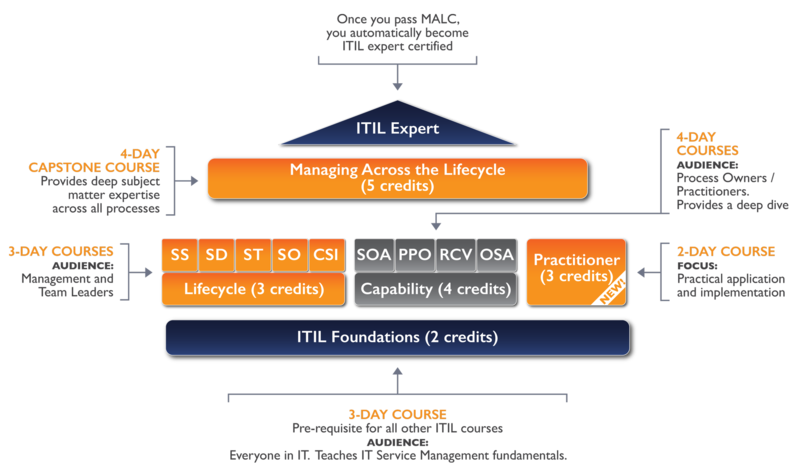 Are there any prerequisites for taking the ITIL v3 Foundations class? No. Some familiarity with IT is helpful, but not required. The instructor will explain the concepts in real world terms, not (just) technical terms. In fact, many of our students are Project Managers who need to gain a “management level” understanding of IT without having a technical background. Yes! Beyond20 is an Accredited Training Organization through PeopleCert. We are accredited to teach ALL levels of ITIL Training – Foundation, Practitioner, Intermediate, and Expert. We are also a Global Registered Education Provider (REP) through the Project Management Institute (PMI). This is a 3-day class. The exam will be administered onsite on the final day of the course. Beyond20 is a global Registered Education Provider (Global REP). The ITIL Foundations course provides 24 PDUs for those who are PMP certified. The certification exam is included as part of the class, to be taken on the afternoon of the third day. The ITIL Foundations Exam is 40 questions, multiple choice. It is a closed book exam, and a passing score is 26/40, or 65%. Candidates have one hour to complete the exam. We guarantee that all students will pass the exam – in fact, over 99% of our students pass on the first attempt. However, should you need to retake the exam, we will assist you in preparation and set up the retake at no additional cost. You can always attend the course again at no cost, although in most cases this isn’t necessary. No, your ITIL v3 Foundations certification will never need to be renewed.